Og ja, måske den linkede artikel mere er, hvad jeg lige kunne finde, mens jeg alligevel lagde uddraget fra Asiatic Journal på, end den egentlig er god eller i hvert fald dyb. Jeg kan i øvrigt godt lide detaljen med, at de britiske myndighederspersoner lod manden gå igen for ikke at genere de øvrige indsatte i fængslet. Tallygunge ligger i øvrigt i den sydlige del af Kolkata, siger Wikipedia - så denne episode er sket i Bengalen. Manden citeres for at tale Hindustani, ikke bengali, så den kunne givetvis være sket over det hele. 15/05/2009 20:22:33 »Aghora (literally, "non-terrifying") is the spiritual path that seeks to negate all that is ghora ("terrible, terrifying") in life. The ghora encompasses all those experiences that most people find intolerable, for almost everyone is as ready to enjoy life's pleasures as they are to avoid misery. Most spiritual advisers admonish their devotees to shy away from the ghora, but aghoris (practitioners of Aghora) embrace the ghora fervidly, for what most terrifies an aghori is the prospect of becoming mired in duality. Aghoris go so far into the ghora that the ghora becomes tolerable to them; diving deeply into darkness, an aghori finally surfaces into light. No means to awakening is too disgusting or frightening for an aghori, for Aghora is the Path of the Shadow of Death, the path that forcibly separates an individual from attachment to every ordinary self-descriptor. Aghora's temple is the smashan (cremation ground), where aghoris worship death, the Great Transformer, with a savage, all-consuming love. Those who are enslaved by their cravings think aghoris mad for displaying such ferocity in their quest for knowing. They condemn Aghora's outwardly repugnant practices because they cannot see beneath their ritual skin. If they could but peep into an aghori's heart they would find there an ache for Reality so fierce that no means could be too extreme to achieve it. This ache drives the divine fury, the passionately unrestrained non-attachment to absolutely everything, that is Aghora's hallmark. Aghoris earn their illumination by incinerating themselves moment by moment in their own internal fires, laughingly consuming any substance and performing any activity that might further enkindle their awareness. They seize every moment of life that God offers to them, even a trip to the toilet, as a fresh opportunity to surrender to the One. Good aghoris takes their temples with them as they wander the world, ceaselessly amazed to witness the universe consuming itself in the fires of an ongoing cosmic cremation. Aghora like alchemy substitutes for a set recipe of self-development an outline whose details differ for each practitioner. 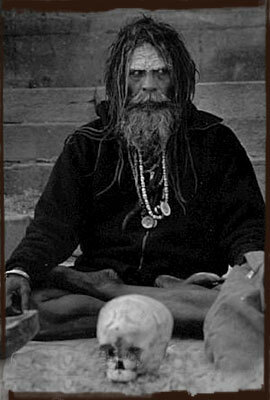 Each aghori and his customs are unique, and in truth all one aghori has in common with another is their degree of intensity and determination. Aghoris become so desperate in their quests that they channel their every thought and feeling into a super-obsession, a single-minded quest to achieve the Beloved. They endeavor eternally to dismember their restricted selves fully, that God may have a free hand to re-member them completely. They die day by day while they are still alive, that by dying to their limitations they can be reborn into the eternal life of Reality. 17/05/2009 02:04:21 Tankevækkende - tak! Der er også en reference til Aghoris i Bollywood-filmen "Raaz - the mystery continues" (2009).